A fart was the start of a staff conflict that ended up costing the Swedish national bank NOK 760,000 (USD 100,000) in compensation. According to computer technician Göran Andervass, 44, a colleague visited his office and let out a big, stinky fart, Aftonbladet reports. Andervass thought the incident was provoking and shouted at his colleague. After the fart and the following shouting, Andervass and his colleague were called in to a meeting with their boss in the national bank. "The boss wanted to know why I had been shouting at my colleague. I explained what it was all about, but my colleague would neither admit nor confirm that he had farted", Andervass told Aftonbladet. The incident was the beginning of a serious conflict, a long sick notice and exclusion from the office. Göran Andervass was fired from his job on 20 December 2001. According to the human resource department in the bank, the reason was "personal issues". The bank thinks Andervass was away sick a lot of the time and that he was not following the rehabilitation plan presented to him by a doctor and the social security office. According to Andervass, there was no such rehabilitation plan. 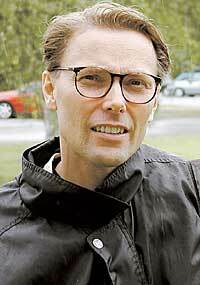 Göran Andervass sued the national bank, and the court sentenced the bank to pay him NOK 760,000 compensation. I don't know why this thread was moved. If ever a story qualified as "breaking news" this one does. There's 100 large in a German bank just waiting to be collected. 'Scuse the off topic rambling, but this reminds me of high school German class (and no, not because we ate knackwurst und sauerkraut in there). If I'm not mistaken, "fart" is Swedish third person singular for 'drive' too. En promp ble starten på en arbeidskonflikt som tilslutt kostet den svenske riksbanken 760.000 kroner i erstatning. 23 posted on 08/28/2003 5:31:23 PM PDT by shhrubbery! Yeah, as soon as the MODS got "wind" of this thread, it was doomed. The problem is that they don't allow dogs in the office. If there was a dog in the room, there'd never have been a problem between the two. Don't they know, "He who smelt it, dealt it!" The situation is very disquieting. THIS is the mostest bestest use of this particular Ping List yet! I agree. The incident should have been allowed to dissipate. Hej! to the Swedish Ping List. I laughed when I saw a FART HINDER sign in Göteborg last summer! It translates as "Speed Bump." The Swedish word fart simply means "speed." It translates as "Speed Bump." The Swedish word fart simply means "speed." Danke Gott for your translation. Because I thought those humps were ... well, something else. Great sign! I'm going to have my son enlarge that on photoshop and print out a couple for our bathrooms. 39 posted on 08/28/2003 9:25:39 PM PDT by shhrubbery! I should've said that sign is a crack-up.